Fans looking for the most affordable lower level ticket will find some of the best options in the Lower Level Endzone sections. Fans will have excellent views of scoring plays at the near endzone, but it will be difficult to make out all the details at the far end of the field, especially in the lower seating rows which do not have much elevation above field level. Each section here has 56 numbered rows of seating, starting with Row 1 at the very front. At the South endzone, entry tunnels are located near Row 16 which make for longer walks to and from the seats for fans in the upper rows. At the North endzone, the entry tunnels are located closer to the top of the section (near Row 40), which leaves the longer walk for fans in the front rows. "Far away from the action. Needs a jumbotron!" "Excellent view, easy in and out"
The only con is the seat numbering is just a bit squashy, in other words, little too close with big people. I would take those seats again in a heartbeat. "Best Seats in the House! 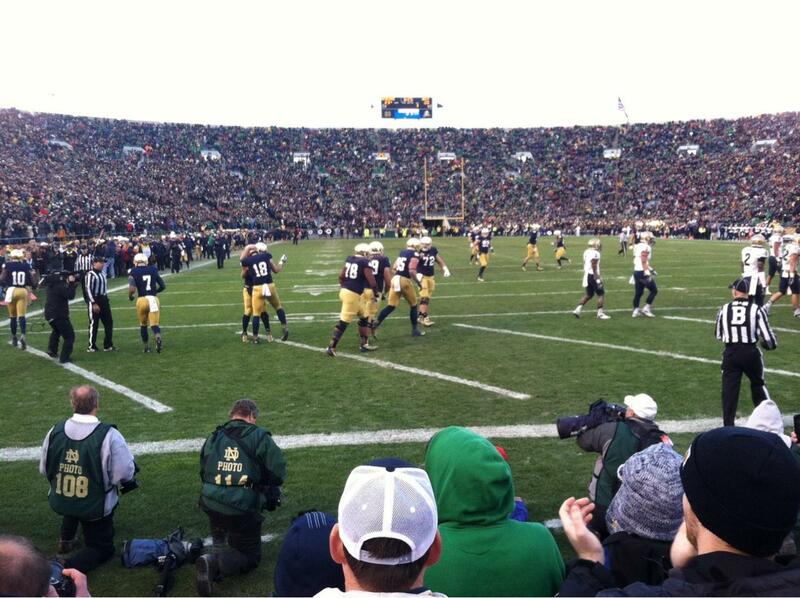 :)"
I crossed one important thing off my bucket list, going to see a Notre Dame game at home. It was the best experience that I've ever had at a football game ! Where is FL19 row B? Section FL19 is the field level seating that is located just in front of section 19 in the south endzone (between the endzone and section 19). These seats are as close as it gets to the field behind the endzone, and feature 6 lettered rows of bleacher style non-backed seating (Row A is closest to the field).